The participation fee is still to be determined. The fee covers local housing during the project, three vegetarian meals a day, ground transportation to and from the airport and project site, local excursions, short-term travel insurance, a Maranatha t-shirt, and luggage tags. Flights, passports, entrance visas, and vaccinations are not included in the participation fee. For accounting purposes this is broken down into a project fee that is tax-deductible and an excursion fee which is not. Children 12 and under have a discount of $150. All prices are listed in US dollars. * Maps may indicate region where project will take place, not a specific site location. 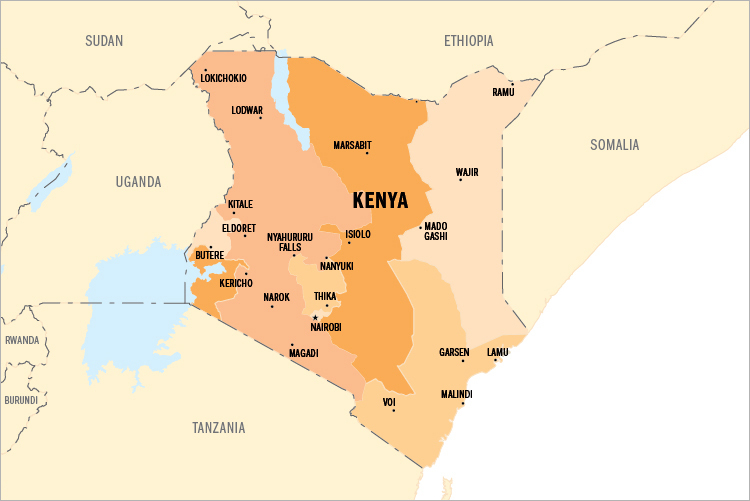 Join Maranatha in the fascinating country of Kenya! There is a great need for churches and school in this eastern African country, and local church leadership has requested Maranatha’s assistance. Volunteers on this project will make a difference at one of the school campuses that Maranatha is currently constructing throughout the country. Many of these campuses have dorms and classrooms that are small, cramped, and deteriorating. The exact school that this group will work at is still to be confirmed, but the need is great at each location. Depending on the school and the volunteers who join the team, there may also be opportunities to conduct local community outreach and children’s programs. This project will also include a safari excursion in the world-famous Masai Mara at the end of the project. ARRIVALVolunteers will arrive in Nairobi, Kenya (airport code NBO) between 6pm and 10pm on Wednesday, February 12, 2020.Please wait for confirmation from Maranatha before purchasing your airfare to ensure there is still space on the project. DEPARTUREVolunteers will depart from Nairobi, Kenya (NBO) after 5:30pm in the evening of Wednesday, February 26, 2020. The accommodations for this project are still to be determined. Please check back later for more up to date information. Volunteers will purchase their own plane tickets to and from Nairobi, Kenya. The dates posted are the arrival and departure dates from the project, but due to travel time, you may need to leave a day or two before the arrival date. Maranatha representatives will meet volunteers upon arrival in Nairobi. Until registration is open the exact details of this project are subject to change. More information will be available in an information packet available for download soon. Please wait for confirmation before purchasing your airfare. Booking outside the advertised flight windows could result in additional fees and missed portions of the project. At the end of the project, volunteers will experience some of the wildlife of Kenya at the Masai Mara. The group will travel to the Masai Mara, one of the largest national parks in Kenya. Within a few hours of being at the reserve, it is possible to see the “Big Five” (lion, leopard, water buffalo, rhinoceros, and elephant) as well as many other wild animals including zebras, giraffes, hippopotamuses, wildebeests, cheetahs, antelope, vultures, hyenas, and much more! During their time at the Masai Mara, the group will stay at the beautiful Sopa Lodge in the game park. At the end of the excursion, the group will return to Nairobi and will visit some popular Nairobi attractions which could include the Kazuri Bead Factory, the David Sheldrick Elephant Orphanage, and the Giraffe Centre. These activities provide an insight to the artisanal goods and wildlife preservation in Kenya. Volunteers will depart for home from Nairobi on February 26. The excursion is considered part of the entire project. All hotels, food, transportation, activities, and park entrances during the excursion days are covered by the excursion fee paid to Maranatha. Passports valid for at least 6 months from date of intended return.